Home » Blog » Is Political Rancor Driving People Away from Facebook? Before the returns started coming in on election day, political commentators were expressing relief that the divisive and seemingly endless campaign season was coming to an end. If only that were the case. Instead, three months on, an environment of political divisiveness has become the norm. To get a taste of the current climate, one need only log-on to Facebook, which has emerged as a prime destination for political news, and sometimes political conflict. Lately, though, I’ve noticed an increase in posts expressing frustration with the constant stream of political news and dissent, and I began to wonder if there was a more widespread backlash and if so, whether it could put a meaningful dent in Facebook’s numbers. To find out, I headed over to Google Trends to see if interest in bailing on Facebook was on the upswing. As you can see in the chart below, each instance of interest exceeding 80 (on a 100 point scale) can be correlated to major news event. Of course, correlation doesn’t always indicate causation, but the data seems to indicate that each controversy has people (at least) entertaining the idea of bugging out. Having pointed that out, you might notice that some items are labeled “Sunday after” the precipitating event. This is because I considered increases in interest during the weekend following an important weekday event to be correlated due to a well-established pattern of muted weekday reactions followed by weekend spikes – particularly on Sunday. My theory is that users have more time to post, react to posts and contemplate/research killing their account on Sunday. 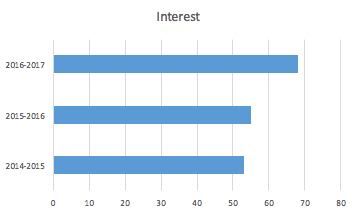 Next, I calculated average interest in the term “delete Facebook” over the 14 weeks between the beginning of November and the end of January in 2014/15, 2015/16 and 2016/17, and found that search interest in deleting Facebook was near-flat at 50 and 51 percent during the first two periods, both of which were non-election years, while interest during the most recent period shot up 17 points to 68. Of course the results of such a cursory look at a single source can’t produce concrete evidence that political rancor is hurting the social media giant, the data does seem to indicate some degree of impact. Having said that, I’m interested in hearing other perspectives. Are there other data sources or approaches that would improve the argument? Are there any clear holes in my approach or conclusion? Is there data that contradicts my theory? Let me know in the comments!